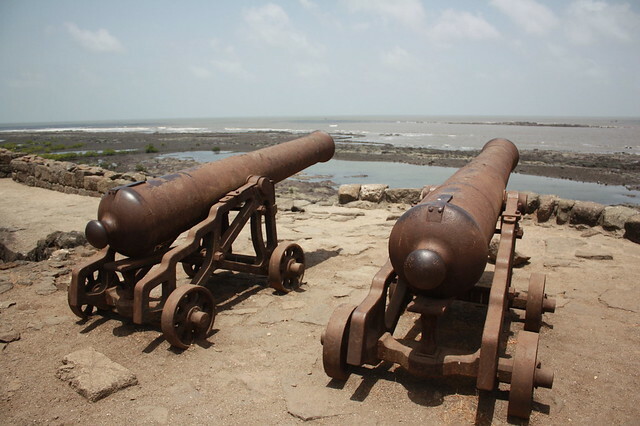 Kolaba fort is a 300 yrs old marine fort , a star attraction at Alibaug was built by Maharaja Chhatrapati Shivaji and is tucked 2 kms into the sea. Massive fortification efforts were undertaken by the guerrilla warfare master and the fort shared the reputation of being one of his main naval stations. The fort allows access for a visit by wading thru the sea water during a low tide, however one needs to take a boat during the high tide. With the waters rising during a high tide it seems to have been located on an island. Kolaba fort has several temples inside and the gate has the shrines of the fort deity and several other Gods like Mahishasur and Padmavati. The fort also has another natural marvel which is a well with sweet water. The well has a Ganpathi temple called the Sidhdhivanayak temple located in front of it. The entrance to the fort is adorned with beautiful carvings of animals and birds like the tiger, elephant and peacocks.